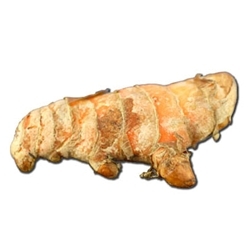 This is authentic Alpine Turmeric Whole Root (the one used by the mystics and NOT the culinary one) that was a favorite of Aleister Crowley, the English occultist. Reportedly, it can be used alone but is often combined with Kaempferia galanga as a tool to create psychic awareness. Combining these two mystical roots enabled the perfect yin-yang / body-mind balance according to ancient scriptures, and may be the reason that Aleister Crowley found it so useful. When burned as an incense, this combination (or Wild Galanga by itself) is thought to produce an energized atmosphere. Many Tibetan incense formulas still use Galanga, especially in formulas for promoting awareness, overcoming physical exhaustion, and creating a pleasant atmosphere for contemplation. Galangal was known to the ancient Indians, and has been known in the West since the Middle Ages. Its stimulant and tonic properties are recognized by the Arabs who ginger up their horses with it, and by the Tartars, who take it in tea. In the East, it is taken powdered as a snuff, and is used in perfumery and in brewing. Another interesting aspect of this root is that in making a tea, it can be re-used several times. Simply boil 1 oz of the root in 3 cups of water for 5 minutes and then remove the rhizome and let it dry for repeated use.